The first thing that strikes you about Samsung's new Android-powered interchangeable-lens camera is how big that 4.8-inch AMOLED screen looks on the back of a camera. Even when it's turned off, the blackness stares back at you like an enrapturing abyss. Then, when you flip the camera on, the TouchWiz Android UI is right there in front of you, showing a special camera widget. 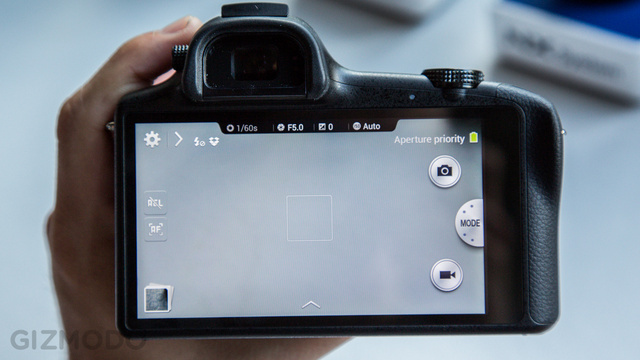 Hold down the shutter, and the camera interface we saw on the Galaxy camera pops up. 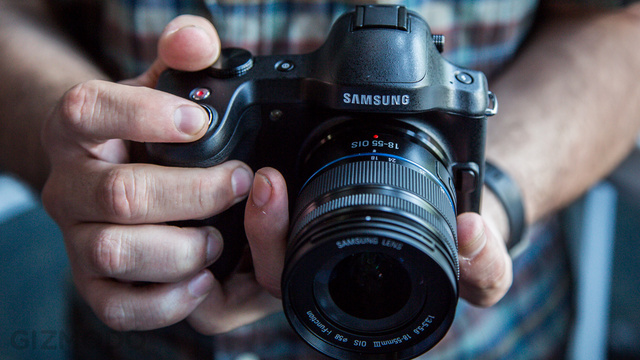 From there, there's an unlabeled click wheel where a mode dial would be on a DSLR. Give it a spin and it'll alternate between basic shooting modes and some of the camere's features. It's all very speedy. Our only complaint is that Samsung didn't make a prettier GUI for the deep menu structure that's native to the NX series. Shooting photos feels like you're using a smartphone camera, but going in to tweak deep camera settings, feels like you're still trapped in the past. This is all very modern stuff applied to the old concept of interchangeable lenses. 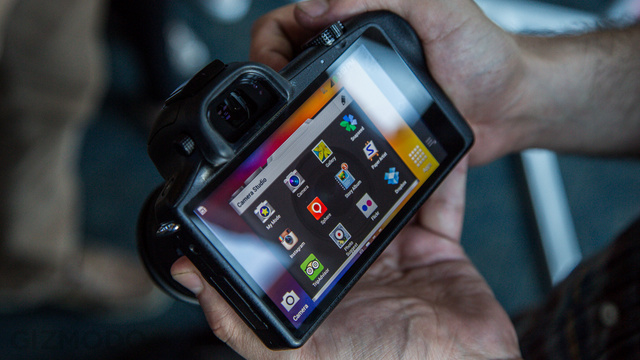 Yup, the whole time you're using this thing, you're staring at the screen like it's a phone, so much you'll almost forget that this thing has a viewfinder you can put your eye up to. You might also forget that the APS-C guts and refined interchangeable optics you're using are so good that it might even be worth sticking you eye into that peep-hole see if you can't make the most of them. We'l have to wait until we've taken the Galaxy NX into the real world to find out if all the newness is useful, or just a distraction. No word on what this camera will cost when we'll actually get this camera in America—if we get it at all. For more info on specs and the like, check out our announcement post. People are becoming more vigilant when it comes to online privacy, so Stanford University's new initiative couldn't have come at a better time. 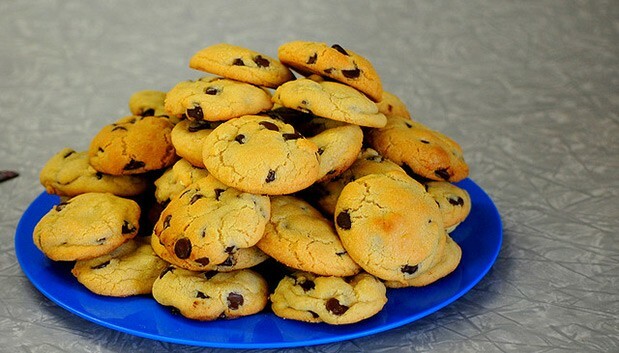 The project, called Cookie Clearinghouse, will curate catalogues of websites whose cookies browsers should or shouldn't allow. As designed, it works along with a Safari-like patch Mozilla is testing for Firefox that allows cookies from sites you've visited but blocks third-party cookies from sites you haven't. Theoretically, that'll prevent advertisers or other entities from tracking you around the web, but the method isn't foolproof -- having a centralized list will prevent your browser from saving the cookies of an ad or a spam website you've accidentally clicked on. To establish which sites are kosher and which aren't, the folks at Stanford are slated to meet up with an advisory board. It will be comprised of privacy researchers, law pundits, small business experts, as well as reps from Mozilla and Opera. Unlike Do Not Track -- another Stanford initiative from which this one later evolved -- advertisers don't have to opt in for inclusion on either list. It's just up to developers (other than Mozilla) to integrate this more thorough solution into their browsers' privacy options. A variety of smartwatches have popped up over the last year or so like the Pebble, I'm Watch, and Metawatch by Strata. The list goes on. Meanwhile, we have knowledge of Google working on a smartwatch, and the rumor mill keeps churning around Apple's supposed "iWatch." But now there's another smartwatch entering the market. Androidly claims to be the first full-featured smartwatch for Android. It's a pretty big claim to make, but it seems like it could be true. Androidly is essentially a full-fledged smartphone that you wear on your wrist. Most smartwatches out there today merely serve as a complement to your smartphone, but Androidly is able to function entirely on its own. Androidly allows you to make and receive phone calls, take photos, and navigate via Google Maps directly from your wrist. The smartwatch has a built-in speaker and microphone, but you can also sync it with a Bluetooth headset for making calls. It can also connect to Wi-Fi so you can browse the Internet, watch YouTube videos, and so on. It's probably not ideal for most people to watch videos on a 2-inch screen, but it seems to be a nice added feature. Meanwhile, Androidly allows you to install any Android application from the Google Play Store. 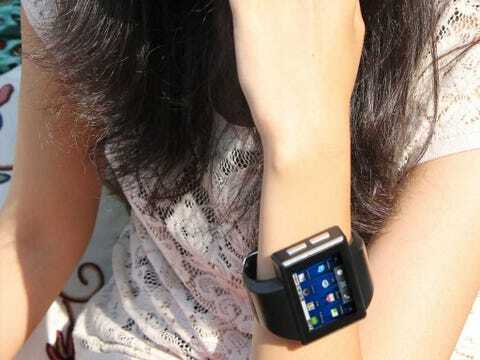 That means you can access apps like Facebook, Cut The Rope, Twitter, and Angry Birds directly from your wrist. 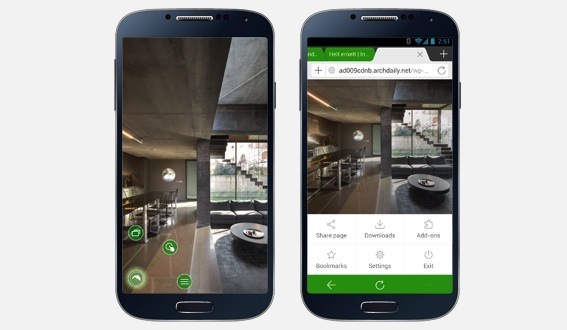 Androidly is currently available for pre-order at prices varying from $229 to $269. Removable Storage: 8 GB SD included., Upto 16 GB SD. 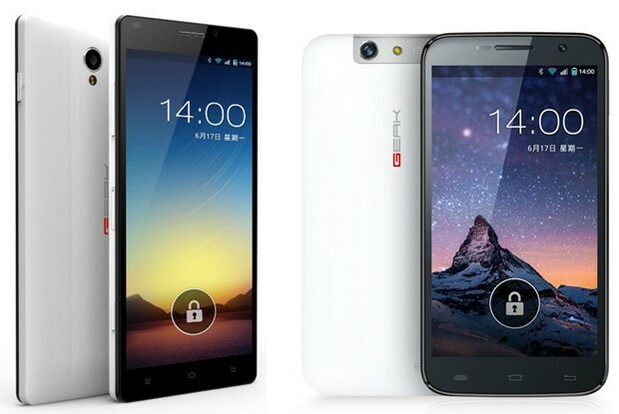 Screen: 2 inch, Capacitive Touch Screen., 320×240 Resolution. You use Google. Or maybe, just maybe you use Bing. Sometimes one is better. Sometimes the other is prettier. Sometimes it's the other way around. Whatever. The most hilarious, ridiculous difference between the two though? 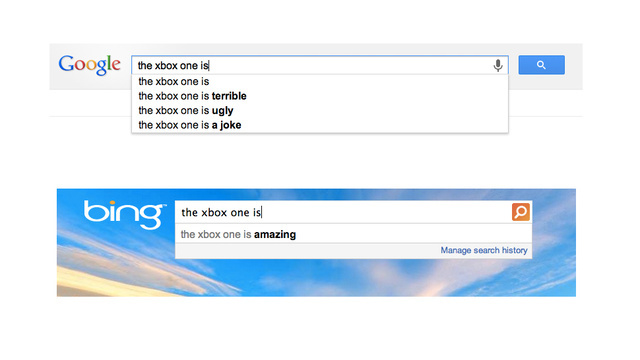 How they auto-complete the Xbox One. Google Instant finds words like terrible, ugly, a joke and so forth. Bing? Just one. Amazing. O Romeo, Romeo, wherefore art thou Romeo. Even if you failed English class, you'd recognize that phrase anywhere. It's from Shakespeare's Romeo & Juliet. But would you recognize this phrase: O Romep+ Rpldo wiepffnre arr!riov Romep@. That's Shakespeare too. 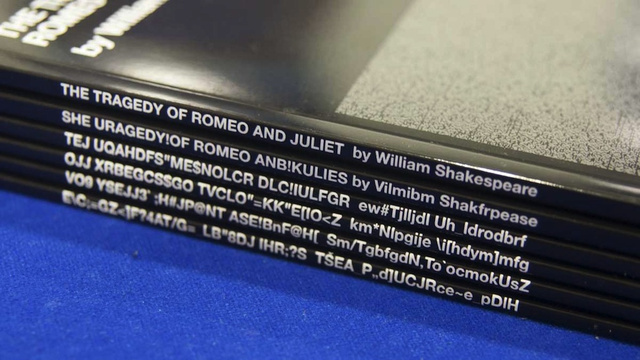 If Shakespeare was compressed over and over again by JPEG. Tom Scott created a little experiment to poke fun of the lossy nature of JPEG. Every time you edit and save a picture in JPEG, you're going to lose something from the original. Even if you don't see it (and most of us don't see it), it's gone forever. Scott thought it would be fun to see what we would lose in JPEG if we saw converted it in text and boy it garbled up Shakespeare real good. Even on ‘maximum’ quality, almost all the characters are replaced by their neighbors in the alphabet. On an image, that would be a minuscule change in color, undetectable to the eye: but rearranged into a different form, even ‘maximum’ quality is enough to render the text a significant challenge to decipher. 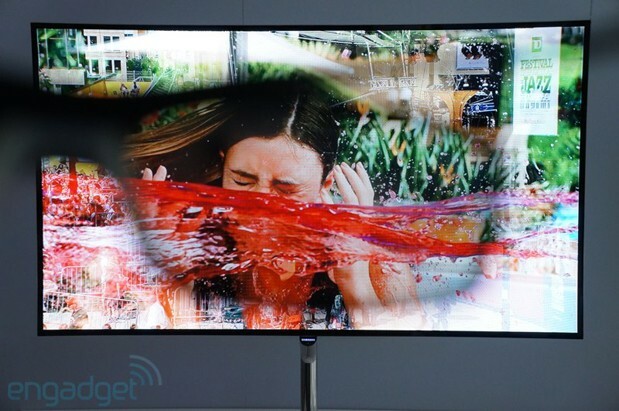 Samsung told us to expect its 55-inch OLED TV sometime in July, but there's now a chance that South Koreans will get an early look. Yonhap News Agency hears through tipsters that the premium set could ship to Samsung's homeland next week, with a price somewhere north of 10 million won ($8,840). It might not be alone, either -- those same sources also claim that the company's curved OLED TV may arrive at the same time. Samsung hasn't confirmed anything, but such moves would line up with the firm's tendency to debut products in its home country. Besides, Samsung rarely lets any of LG's salvos go unanswered. Dolphin has done a pretty fine job when it comes to keeping its browser loaded with plenty of handy features, both on Android and iOS. Now, the Dolphin's hit version 10 for Android, bringing along an array of things including a revamped user interface, drag-and-drop support for speed dials on the home screen, additional swipe-based gestures and a new store for web-based applications. In addition to all that, Dolphin brought back support for Adobe Flash, while also taking to this release to improve the built-in search options and allow users to dig through sites like Amazon, Twitter, Wikipedia and YouTube right from within the app. The overhauled Dolphin browser is now available on Google Play, so give the source below a quick click if you're eager to check out these changes. Ever wanted to be just as cool as the government? 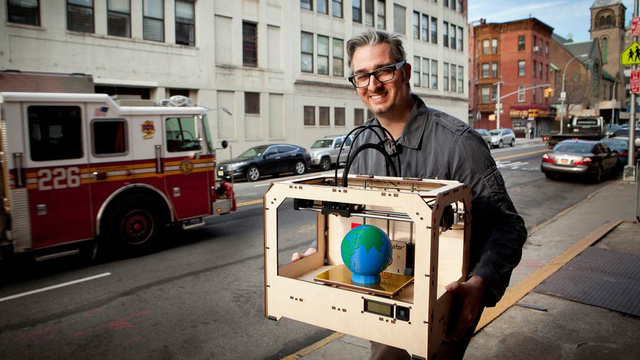 Ever wanted to spy on your own house or watch the newspaper guy throw the paper onto your lawn? Or maybe there's a small chance that you actually have a legitimate need for video surveillance on your property but, like me, are too poor to buy top-of-the-line hardware and software for it. If this sounds like you, then read on! I, too, had the interest of using a surveillance camera in my house. I accomplished this by re-purposing an old webcam I had sitting around, so it would finally get some use. Now, I use that webcam as my HamCam, to spy on my hamster. What I did was, I plugged my webcam in to my desktop and installed a program called iSpy. This allowed me to use my webcam as a motion-sensing surveillance camera. Once I installed that, I went through the settings and made a few tweaks to settings. Specifically, I now have it record video upon detecting motion. I also have it run on a schedule, so it turns off around when I go to bed, and turns on again in the morning when there is light enough to see again. But what about syncing to the cloud, you ask? Fret not; that base is covered too! What I did to achieve this was change the directory my HamCam videos are saved in, so that it's in my Dropbox folder. Now, I can view it on my Dropbox from anywhere I am. Each time motion is detected, I also have it store a snapshot of the photo in my Dropbox for my viewing pleasure. I wasn't finished just yet, though. The finishing touch to this was having the photos and videos auto-import into my phone's gallery for ease of access. I accomplished this by using an app called DropSync, which auto-downloads or uploads photos to/from your Dropbox. The Pro key costs $4.99, but it's worth it to me. I had them save to a folder in my SD card under DCIM called HamCam. Because they're in my DCIM folder, they can also be auto-backed up to my Google+, and I can spam my friends with them! ...but I don't, because I don't have friends. I have a hamster. I should mention that this was done on a Windows PC, and my phone is an Android phone. If there is anyone who's had similar experiences on Linux or OSX, with an iPhone or other type of phone, they might post about it below and what they use (hint hint, guys!). Look at my little Hamlet unknowingly being watched at all times. The NSA would be proud. While most high-end Android phones currently sport Qualcomm's Snapdragon 600, there's another chip announced earlier this year waiting to hit the scene: the Snapdragon 800. Now, the first benchmarks of that new chip are in—and its GPU promises to smoke the competition. Today we had a chance to play with Qualcomm's latest MDP devices (tablet and phone) which pack the company's mighty Snapdragon 800 SoC (MSM8974). The tablet is slightly larger than than last year's and features an 11.6-inch 1920 x 1080-pixel display, 2GB of LPDDR3 RAM, 32GB of built-in flash storage (with microSD expansion), USB 3.0 support and a 12 megapixel AF rear camera with flash (2MP fixed-focus in front). All of this is crammed into a slim (0.46 inches / 11.7mm) chassis that's powered by a 3400mAh Li-ion battery and incorporates a bevvy of radios (LTE band 17, WiFi ac, Bluetooth 4 LE, GPS, NFC) and sensors (including pressure and humidity). The phone shares most of the tablet's specs but swaps the screen for a 4.3-inch panel (1280 x 720 pixels) and the battery for a smaller (1500mAh) pack. 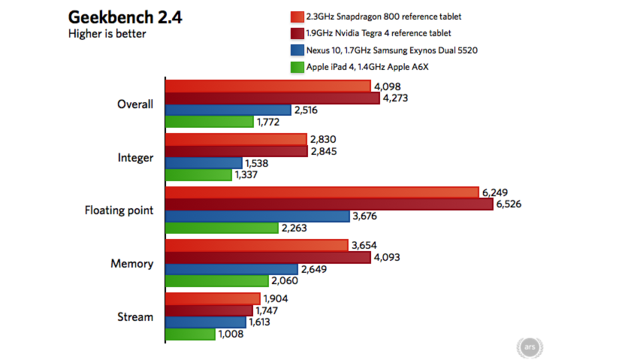 We put these Snapdragon 800-equipped MDPs through their paces by running our usual suite of benchmarks (plus a few more). The results? Prepare for ludicrous speed! More after the break. If Vine still leaves you pining for the choppiness of GIFs, Microsoft's got you covered -- on Windows Phone 8, at least. 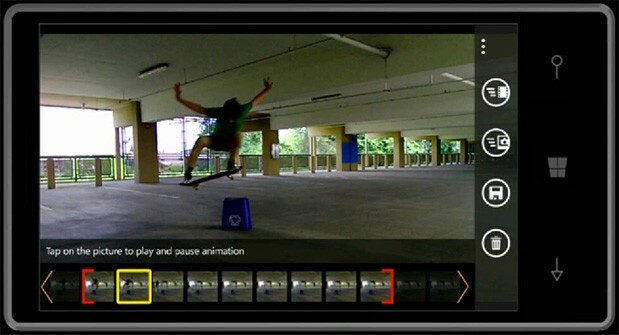 Redmond's Blink app, which helps smartphone photographers capture bursts of images, has hit version 2.0 and scored the ability to create short animated clips, aptly dubbed Blinks. In addition to the bite-sized videos, the latest update bakes in camera settings in capture mode, sharing to social networks and web galleries for shared creations. Microsoft Research also released Blink Cliplets for Windows 8 and RT, which allows users to layer static and dynamic elements atop footage. Hit the break to check out the new release of Blink in action, or jab the first source link for the download. 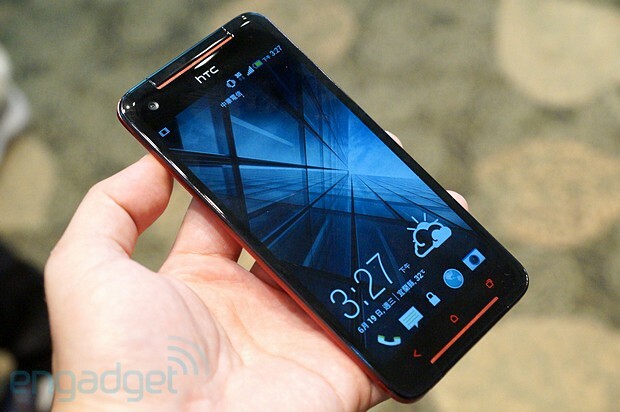 HTC's just pulled back the proverbial curtains on the Butterfly s at its Taiwan launch event. It'll arrive boasting a familiar-sounding 5-inch 1080p display, front-facing BoomSound stereo speakers and Sense 5 as expected. When it comes to internals, the Butterfly s runs Android Jelly Bean on a quad-core 1.9GHz Snapdragon 600 (faster than the HTC One), an impressive 3,200mAh battery, quad-band HSPA/WCDMA radio, 2GB of RAM and 16GB of built-in storage, expandable once again through microSD. As for imaging, alongside that primary UltraPixel camera and Zoe software features, there's a 2.1-megapixel wide-angle shooter on the front. It's currently scheduled for a release in July in Taiwan, accompanied by a NT $22,900 (roughly $766) price tag, but no word when (or even if) it'll reach foreign shores. Update: Our Chinese sister site just spent some hands-on time with the device. Check out their first impressions right here. And look! A gallery right below! 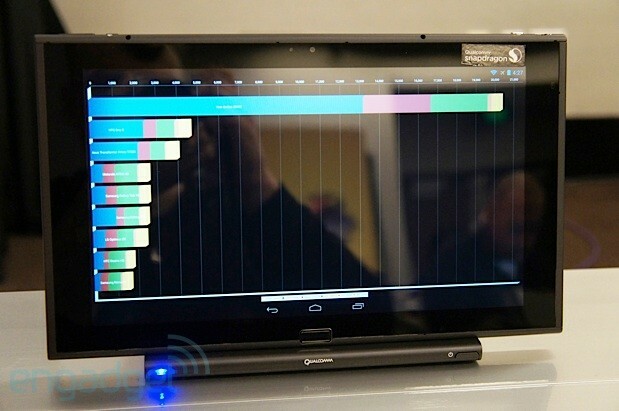 As quick as Lenovo has been to hop on the Ultrabook bandwagon, it hasn't been so eager to launch big-screened models. 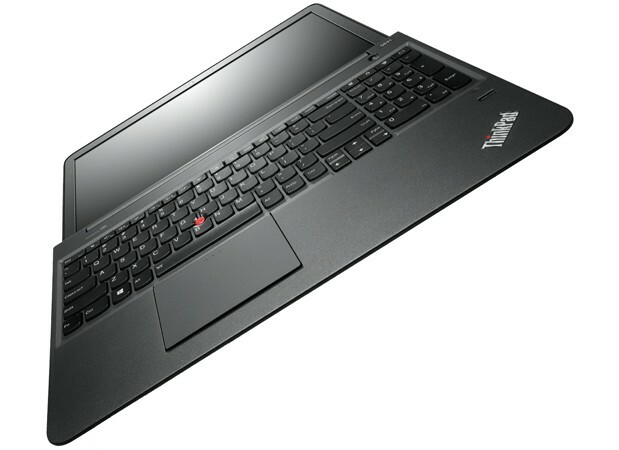 Its new ThinkPad S531 explores that territory at last: the Windows 8 PC mates a slim profile with both a 15.6-inch, lay-flat LCD and a large keyboard. The experience will otherwise be familiar to those who've seen the S431, as it shares the same basic design language, the OneLink dock connector and a nine-hour battery. Unfortunately, the similarity also extends to the Ivy Bridge-era Intel processor -- there's no Haswell inside, at least for now. 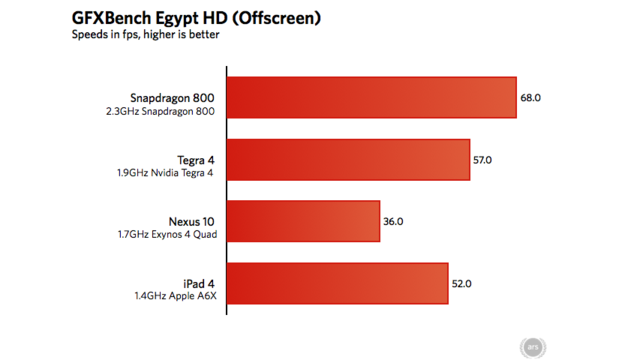 Still, the £575 ($900) UK price is within reach of many buyers, and there's a 1080p display option coming in July. Lenovo hasn't said if or when the S531 will reach the US, although we hope it gets a processor upgrade if and when it crosses the Atlantic. It's hardly a secret that AMD has stepped out of its x86 comfort zone to develop an ARM-based server chip, but now we know a little more about it. Going by the name of "Seattle" and scheduled for launch in the second half of next year, it'll be built around ARM's 64-bit Cortex-A57 in either 8- or 16-core configurations, which will likely be clocked at a minimum of 2GHz. 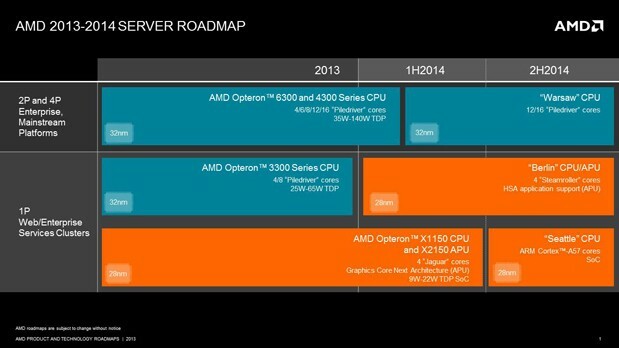 In an apparent acknowledgement of ARM's superiority at low wattages, we're told that this design has the potential to deliver 4x the performance of AMD's current Opteron X processors, with improved compute-per-watt. 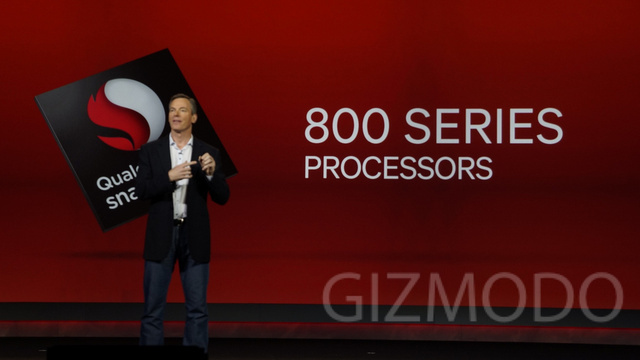 There's a clear limit to AMD's reliance on ARM, however, as it'll use Seattle to up against Intel's little Atoms, but will continue to sell its own x86 designs for higher-power applications. Meanwhile, we're still waiting on something more interesting from this union, which might be an ARM CPU paired with a Radeon HD graphics processor in some sort of mobile-class SoC. Guess we'll just have to be patient. The dream of wearing a lightweight headset, like the Oculus Rift, in order to simulate physical presence isn't limited to the imaginary worlds of video games. One man's vision is that of immersive TV shows, movies and live sports. In fact, David Cole, co-founder of Next3D and an industry veteran who helps content creators and providers produce and deliver 3D, has been using his Rift dev kit to bring TV and film to life since the kits started shipping in March. The company is combining its video processing and compression technology with its experience in content production and stereoscopic delivery to offer what it's called Full-Court. Next3D hopes to leverage its existing relationships with creators and providers to assist them in jumping into the world of live-action VR content. This includes both pre-recorded and live broadcasts. We wanted to see this firsthand, so we jumped at the opportunity to witness the creation of content and experience the results. 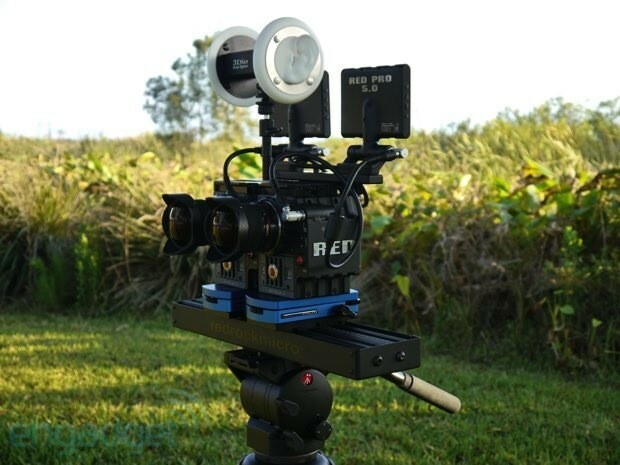 This trial run of Next3D's stereoscopic, 180-degree field-of-view camera rig, and the post-processing to adapt it to VR, was part of the production of the paranormal investigation show, Anomaly, at Castle Warden in St. Augustine, Fla. Being nearby, we braved the perils of the haunted surroundings to tell you about what we hope is only the beginning of virtual reality content. 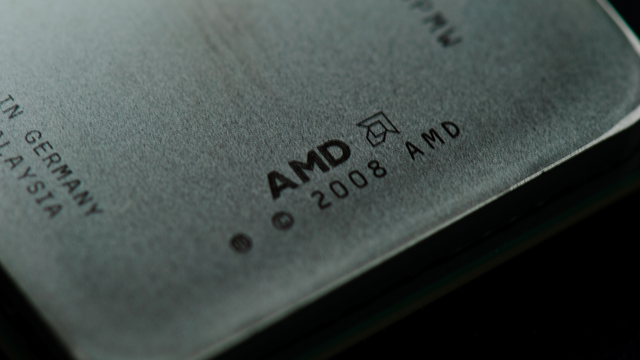 The Wall Street Journal is reporting that AMD is taking a leap into unknown waters, as it readies its first ever ARM chip. The new chip—codenamed 'Seattle' and previously hinted at—is apparently based on the architecture designed by ARM which is now prolific in smartphones and tablets. Interestingly though, according to the Wall Street Journal, the chips will be aimed at server systems—where the same power savings required by mobile applications are becoming increasingly attractive. It won't be the first time a company has offered up an ARM chip for use in servers—Applied Micro Circuits has done something similar before with the X-Gene server-on-a-chip—but AMD does carry enough weight to make the scheme potentially successful. That's a fairly big "potentially": there are enough question marks here—does the world want ARM in servers, can AMD offer a decent ARM products, blah, blah, blah—that success is far from guaranteed. 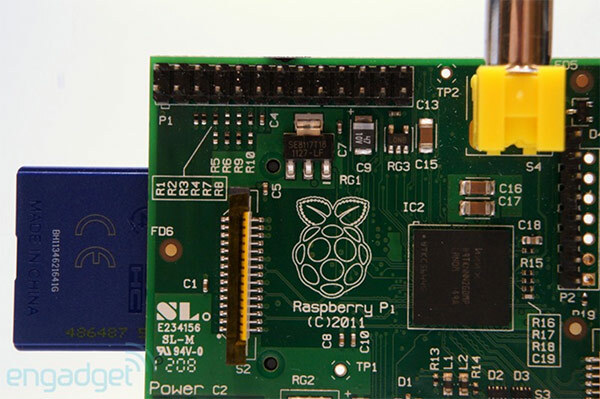 The Raspberry Pi-focused XBMC port Raspbmc's June changelog is a lengthy one. Among the changes are new settings, new skins, support for the Stealth Nighthawk F117A device and changes to make booting up faster, among many other things. Getting this month's update should only require rebooting one's Raspberry Pi, and a few new mirrors that have joined the network should make downloading the updated software even faster. That's not all however, because the July update is promising Linux kernel updates, Raspbmc "Cloud" features with automatic settings backup / restore across multiple devices and an unspecified "special announcement." Though you may think drones do all the fighting these days, actual soldiers on the ground are still used to call in airstrikes. Sometimes it's still necessary to visually confirm targets before the flyboys create a smoking crater. Though the army has toyed with smartphones and other means to connect soldiers, Raytheon has created a new JTACs (Joint Tactical Air Controller system) prototype for ground forces to let them separate friendlies from enemies and relay the information to strike forces. The system consists of a chest-worn computer, heads-up monocle viewer and wrist-worn display, which together let the solider select a target merely by looking at it and pressing a button. They can also tag friendly forces the same way or send update situational data to the rest of the team, whether they're on the ground or flying a fighter overhead. That assistance from the ground will make it easier for those at the yoke to differentiate between friendlies and targets. We tried the prototype ourselves in a limited, 2D environment here at the 2013 Paris Air Show and, without any help getting set up, were able to tag targets as red diamonds and friendly forces as amber squares. Everything we did was also displayed on second screen, simulating the ability to send live updates to other soldiers or the base. Impressive as it was, the whole thing is merely a prototype for now, though, that could eventually change. 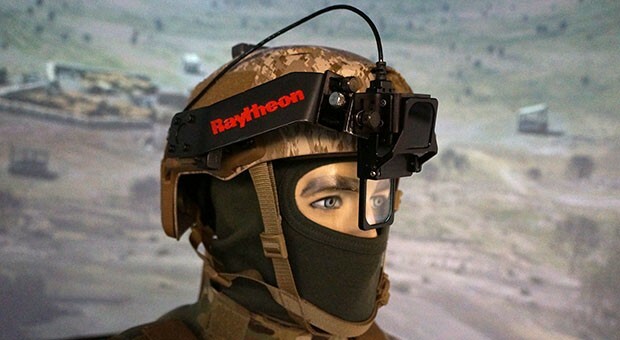 The military AR system is part of a larger platform called AWARE, which Raytheon hopes to eventually deploy. For a detailed explanation about how it works, check out the video after the break. 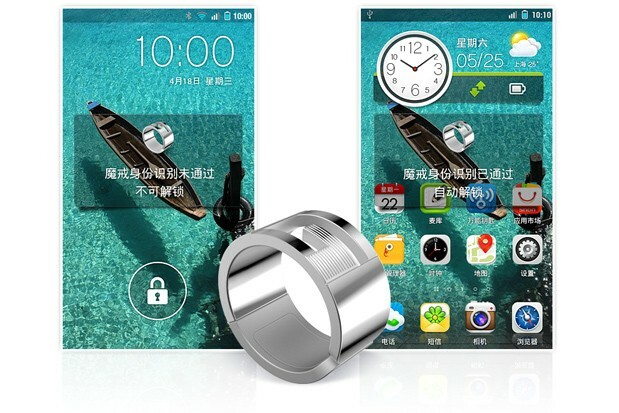 Some say NFC is dead, but GEAK from Shanghai wants to prove them wrong. Announced alongside the GEAK Watch earlier today was this GEAK Ring, a tiny NFC-enabled wearable device that stores your identity. The ring's pitched as an intuitive way to unlock your phone -- just hold it with the hand that's wearing the ring, and it'll unlock without having to type in the password; plus it'll stay awake as long as it's held in the same hand. Another feature is that since the ring has your contact details stored (presumably rewritable), you can also use it to share your contact card with other NFC-enabled devices. But of course, given the risk of NFC cloning, you should treat GEAK's solution as a convenience rather than a more secure method. At launch, this ring will only be compatible with the GEAK Eye and GEAK Mars quad-core phones that were also announced today, but it'll support other devices from the likes of Samsung, Xiaomi and Oppo starting in November. GEAK will be taking pre-orders from August 8th, and it'll cost Chinese buyers ¥199 or about $30 each. It'll sure go nicely alongside that Google ring. There's an outstanding new paper out on NBER today by Ajay Agrawal, Christian Catalini and Avi Goldfarb that looks at the simple economics of crowdfunding sites like Kickstarter, where people post project ideas that they hope to get funded from the masses.. While the whole paper is absolutely worth a read, one map at the end gave us a fascinating look at who is getting all that Kickstarter money and for what. California and New York dominate when it comes to funding, especially in both the arts and technology. 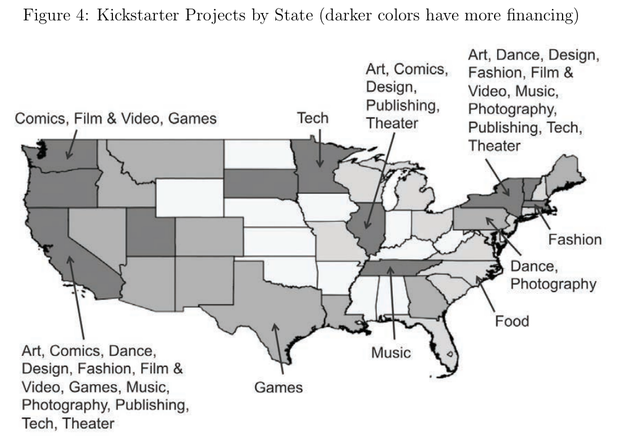 Minnesota is also a hub of tech funding, and Texas has kickstarted games. Tennessee has a lot of musicians looking for startup funding. People are really into the food from North Carolina.